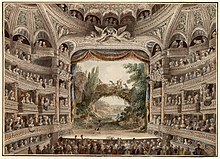 The stage in a theatre is the area where the actors perform. In classical theatres, this used to be separated from where the audience is sitting. This page was last changed on 19 September 2014, at 05:29.